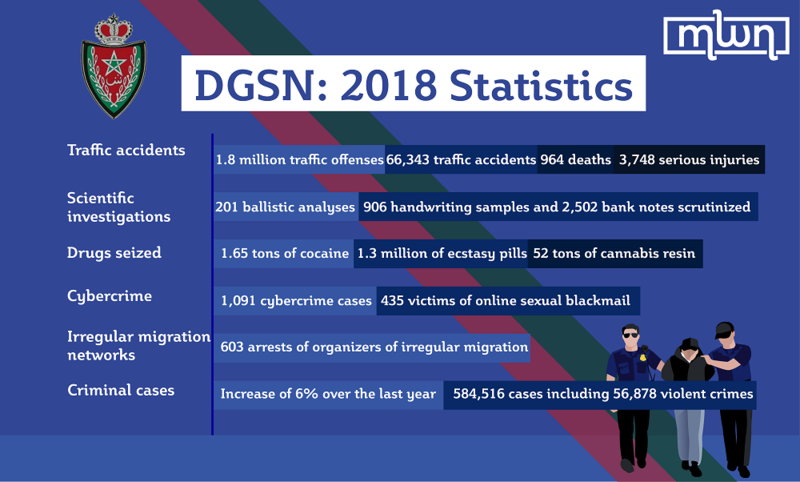 According to its annual review for 2018, DGSN recorded a 33 percent increase in cybercrimes over last year and seized 43 percent more psychotropic and ecstasy pills than in 2017. Rabat – The General Directorate of National Security (DGSN) issued its annual review of crime statistics and police achievements on Tuesday. Among the most striking differences from 2017 is activity among irregular migration networks. The police arrested 603 organizers of irregular migration networks this year, a sharp increase from 294 organizers in 2017. The operation dismantled 45 networks in 2018, compared to 38 in the previous year. The DGSN has improved the scientific and technical structures for criminal investigations, increasing police operations against crime by 6 percent over the previous year. The number of people arrested red-handed or on the basis of a search warrant reached 554,202 individuals, while the number of criminal cases totaled 584,516. Police detained 91 percent of those arrested. Violent crimes make up 10 percent of all cases at 56,878 and have a detention rate of 73 percent. Murder and sexual assault cases fell by 7 percent and 5 percent, respectively. DGSN arrested 37,851 individuals this year in property damage cases and dismantled 495 criminal networks related to violent and armed robberies. Concerning cybercrime, the judicial police recorded 1,091 cases compared to 765 cases in 2017, up by 33 percent over the last year. One third of these cases were detected due to the judicial police’s surveillance system. As for the fight against drugs, in collaboration with the General Directorate of Territorial Surveillance (DGST), police seized 1.65 tons of cocaine, over 1.3 million psychotropic and ecstasy pills (up 43 percent over 2017), 52 tons of cannabis resin, and 693 kilograms of cannabis. Earlier this month, police arrested a truck driver attempting to smuggle 400 bags of hashish (cannabis resin), weighing a total of 10 tons. Police caught the driver in El Jadida, near Casablanca, based on intelligence provided by DGST. 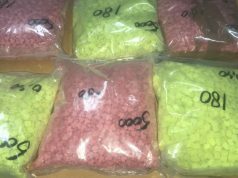 In November, Morocco’s DGSN and customs thwarted an attempt to traffic 493,700 ecstasy pills into Morocco through Tanger Med Port. In the field of international security cooperation, DGSN executed 80 international information requests, including 44 letters of request relating to cases of drug smuggling and money laundering. 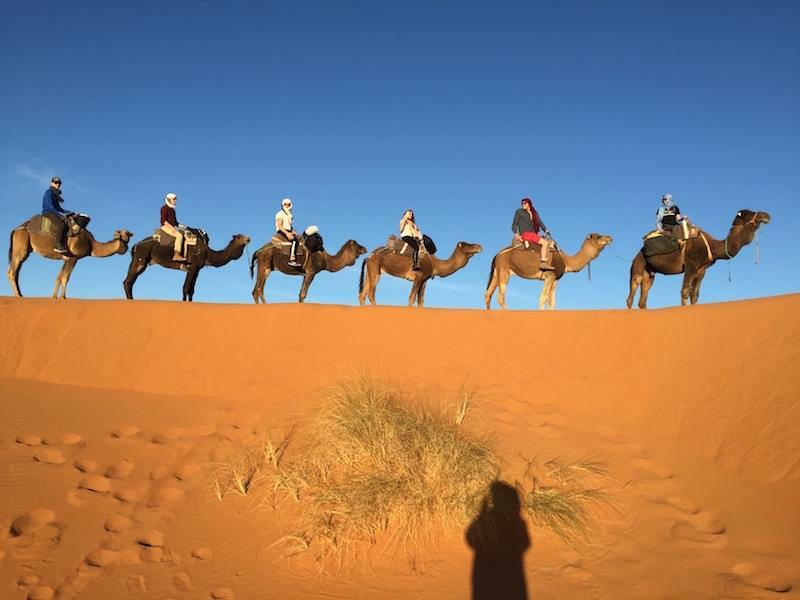 The National Central Bureau (Rabat Interpol) made public 55 international arrest warrants, issued by the Moroccan judicial authorities for wanted persons of various nationalities, resulting in the arrest of 49 individuals. 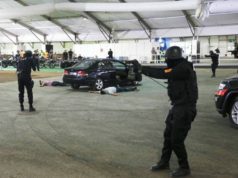 As part of international cooperation to counter foreign terrorists using Mediterranean maritime routes between North Africa and southern Europe, Interpol officials supervised special trainings to help Moroccan officers secure Moroccan seaports against foreign terrorists. 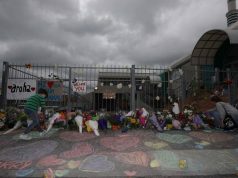 The counter-terrorism operation, codenamed “Neptune,” also addressed threats from firearms, drugs, and human traffickers. This year was also marked by Casablanca’s laboratory of the scientific police obtaining the ISO 17025 certification. The award acknowledged DGSN’s effort and motivation to develop scientific and technical police structures. The police technical services carried out 201 ballistic analyses, involving 108 firearms, 924 replicator weapons, and 2,748 rounds of ammunition. The technical services also analyzed 906 handwriting samples on 1,757 documents, such as bonds, bank checks, and identity documents. Police also scrutinized 2,502 bank notes, including 1,562 bills of foreign currency. The Central Laboratory for Digital Trace Analysis handled 584 cases involving the use of mobile phones and 124 computer-related cases. 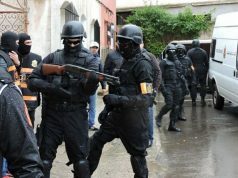 The judicial police laboratory of Casablanca, for its part, received 10,431 cases this year compared to 9,294 cases in the previous year, up 12 percent. Requests for DNA analysis accounted for 81 percent of the cases at 8,410 cases, including those related to fire and explosives (761 cases) and toxicology and drugs (977 cases). This year, DGSN adopted an information management system for the collection of road traffic offences and the rationalization of fixed fines collection. As a result, DGSN recorded over 1.8 million traffic offenses and began infringement proceedings on 573,557 vehicles. DGSN registered 66,343 traffic accidents with bodily injuries, compared to 61,686 accidents in 2017, up 7.5 percent. The recorded accidents caused 964 deaths, 3,748 serious injuries, and 84,048 minor injuries, exceeding the number of deaths and injuries recorded in 2017. As part of its strategy to bring security services closer to citizens and to cover expanding urban areas, the DGSN created 23 new security services, including police districts, police stations, and traffic accident services in some cities, such as Casablanca, Laayoune, Taounate, Sale, Fez, Tantan, Safi, and Rabat. In 2018, the DGSN established a new system of command and coordination rooms for the brigade rescue units in Rabat, Sale, Temara, and Marrakech. The system, which the DGSN aims to generalize in many cities, is still in the experimental stage in Fez and Tangier. The new command rooms received 127,770 calls, leading to 67,542 police interventions. The traditional command rooms using the telecommunication system received approximately 1.7 million telephone calls which led to 678,283 security interventions. 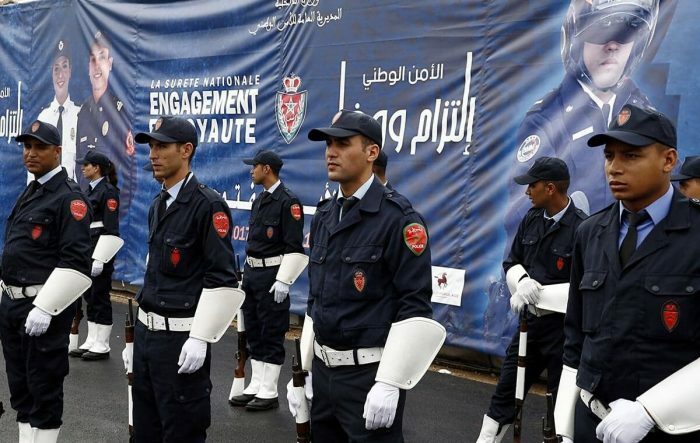 In September, DGSN organized open days for the public under the theme “National Security, Citizen Police” in Marrakech. Units conducted 56 simulation exercises, involving cavalry, police dogs, biker brigades, a musical troop, the infantry brigade, and rapid reaction forces. While reviewing its activities, the DGSN reaffirms its determination to preserve public order, reinforce the feeling of security, and improve its quality of service.